" . . . uphold the scientific development concept as the important guiding principle in strengthening national defense and army building; push national defense and army building forward in a faster and better way . . ."
Sources for PLA modernization include domestic defense expenditures, indigenous defense industrial developments, and foreign technology acquisition - all of which are driven by the performance of the economy. China's economic growth has enabled Beijing to invest ever increasing resources in its defense sector over the past 15 years. As its domestic defense industry matures, China is acquiring foreign weapons and technology, primarily from Russia, to fill near-term capability gaps. In the long term, however, Beijing seeks a wholly indigenous defense industrial sector. China's defense industries benefit from foreign direct investment and joint ventures in the civilian sector, technical knowledge and expertise of students returned from abroad, and state-sponsored industrial espionage. 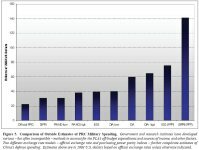 The EU arms embargo not only remains an important symbolic and moral restraint on EU countries' military interactions with the PLA, but a lifting of the embargo would expand China's access to military and dual-use technology to improve current weapon systems and develop indigenous capabilities to produce future systems. On March 4, 2007, Beijing announced a 17.8 percent increase in its military budget, bringing its official defense budget figure for 2007 to approximately $45 billion. This development continues a trend of annual budget increases that exceed significantly growth of the overall economy. Analysis of PRC budget data and International Monetary Fund (IMF) GDP data for the period of 1996 to 2006 shows average annual defense budget growth of 11.8 percent (inflation adjusted) compared with average annual GDP growth of 9.2 percent (inflation adjusted). Of note, China's 2006 Defense White Paper contains a similar analysis in stating that between 1990 and 2005 the defense budget grew by an average of 9.6 percent between, while China's GDP over the same period grew in constant prices an average of 9.7 percent yearly, according to the IMF. The 1996-2006 data is a more useful measure, however, as it covers the period following the 1995 and 1996 Taiwan Strait crises and incorporates the 9th and 10th Five Year Plan periods (1996-2000 and 2001-2005, respectively) in which the post-Persian Gulf War reinvigoration of the PLA modernization drive would be fully reflected. Substantial growth in China's defense budget aside, China's published defense budget does not include large categories of expenditure, including expenses for strategic forces, foreign acquisitions, militaryrelated research and development, and China's paramilitary forces. 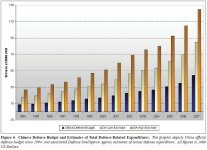 The Defense Intelligence Agency (DIA) estimates China's total militaryrelated spending for 2007 could be as much as $85 billion to $125 billion. Accurately estimating Chinese military expenditures is a difficult process due to the lack of accounting transparency and China's failure to comply with international standards for reporting military expenditures and funding. As a result, outside estimates of China's military spending vary widely. For example, select government and independent calculations for the PLA's expenditures for 2003 - the most recent year for which a significant number of institutions published estimates - ranged from $30.6 billion to $141 billion based on official exchange rates or purchasing power parity (PPP) models. China's declared budget in that year, in contrast, was $22.3 billion. The United States and other countries have, for many years, urged China to increase transparency in defense spending. To date, Beijing has provided only highly aggregated military budget data in its Defense White Papers. Moreover, some Chinese officials remain opposed to candid dialogue on the subject. In response to an August 2006 press question on transparency in PLA budgeting, the PRC's UN Ambassador in Geneva, Sha Zukang, asserted bluntly that "it's better for the U.S. to shut up and keep quiet" about it. Defense industry modernization accelerated in the mid-1990s based on reforms to rationalize military procurement and increase innovation among China's state-owned defense companies. These reforms have enabled the development and production of select weapon systems, such as missiles, fighter jets, and warships, approaching performance parameters comparable to Western systems. Missile and Space Industry. China develops and produces a broad range of ballistic, cruise, and surface-to-air missiles. Improved production capabilities will enable China to more efficiently address force modernization goals by enhancing production of existing missile designs and supporting the development of new cruise and ballistic missiles with longer ranges and precision strike capabilities. China's space launch vehicle industry is expanding to support the national emphasis on satellite launch capability and the manned space program. China hopes to have more than 100 satellites in orbit by 2010, and to launch an additional 100 satellites by 2020. Shipbuilding Sector. In the last five years, China's shipyard expansions, mainly in the commercial container ship market, have increased China's overall shipbuilding capacity. Dualpurpose (military/civilian) shipyards are capable of supporting construction of major combatants, large amphibious ships, and supertankers. China is capable of serial production of modern dieselelectric submarines and is moving forward with new nuclear submarines. China continues to rely on foreign suppliers for propulsion units, and to a lesser degree for weapons systems, sensors, and other advanced electronics- and materials-based ship-borne technologies. Aircraft Production. China's commercial and military aviation industry has advanced from producing direct copies of early Soviet models to developing and producing indigenous aircraft. China is producing improved versions of older aircraft as well as modern fourth generation fighters, and is developing a fifth generation combat aircraft. China continues to seek Russian and other foreign assistance in areas such as engines and avionics. China's commercial aircraft industry has imported high-precision and technologically advanced machine tools, electronics, and other components. This dual-use technology can also be used in the production of military aircraft. Transfers of technology and skills from foreign joint ventures. Increased government funding for research, development, and procurement. Legal and illegal acquisition of foreign military and dual-use technology. Increased partnerships with academic institutions, which improve student recruitment and technical training for existing staff. China's reverse brain drain. Many of China's new generation of scientists, engineers, and managers are returning to China after receiving training and gaining experience abroad. In 2005, China signed arms agreements with foreign suppliers worth almost $2.8 billion, making it the third largest arms recipient among developing countries. Russia remains China's primary weapons and materiel provider, selling it advanced fighter aircraft, missile systems, submarines, and destroyers. China is currently negotiating the purchase of additional surface-toair missiles, combat aircraft, aircraft engines, and assault and transport helicopters. China relies on Russian components for several of its production programs and has purchased production rights to Russian weapon designs. Russia cooperates with China on technical, design, and material support for numerous weapons and space systems; for example China's Shenzhou manned space module is based on the Russian Soyuz capsule. Israel has also historically been a supplier of advanced military technology to China. The Israelis transferred HARPY UCAVs to China in 2001 and conducted maintenance on HARPY parts during 2003-2004. In 2005, Israel began to improve government oversight of exports to China by strengthening controls of military exports, establishing controls on dual-use exports, and increasing the role of the Ministry of Foreign Affairs in export-related decisions. In January 2007, Israel implemented new dual-use export controls, based on the Wassenaar Arrangement. As of February 2007, legislation pending in the Knesset would adopt Wassenaar controls on munitions list exports. It remains unclear to what extent the new export controls will prevent additional sensitive militaryrelated transfers to Beijing in the future. Despite their history of strong arms trade relationships with China, Russia and Israel have usually refrained from transferring their most sophisticated weapons systems to China. To diversify its arms supplier base and acquire advanced technology, the PRC is looking to alternative suppliers such as Europe. Since 2003 China has been pressuring EU states to lift the embargo on lethal military sales to China that the EU imposed in response to the PRC's 1989 crackdown on Tiananmen Square demonstrators. In their Joint Statement following the 2004 EU-China Summit, European leaders committed to work towards lifting the embargo, a pledge they repeated in 2005 and 2006. Although the issue officially remains on the EU agenda, the current political sentiment among most Member States remains opposed to lifting the embargo in the near future. Some Member States have advocated eliminating the embargo in the context of making the EU's enhanced "Code of Conduct" on arms exports binding; the Code governs arms transfers to third countries but is currently a voluntary instrument. Although some in the EU have argued that ending the embargo and instead subjecting exports to China to the terms of the Code of Conduct would result in no qualitative or quantitative increases in China's military capabilities, other EU members remain concerned, as does the United States, that the provisions of the Code remain inadequate. Lifting the EU embargo would likely contribute significantly to the PLA's modernization goals. An end to the embargo would raise the possibility of competitive pricing for arms sales to China, giving Beijing leverage to pressure its existing suppliers - including Russia, Israel, and Ukraine - to provide even more advanced weapons and favorable terms of sale. Increased military-to-military exchanges consequent to arms sales resulting from lifting the embargo could also give the PLA access to critical military management practices, operational doctrine, and training. Finally, the transfer of sophisticated military and dual-use technologies that China most likely desires from the EU - C4ISR components and systems, advanced space technology, radar systems, early-warning aircraft, submarine technology, and advanced electronics for precision-guided weapons - would advance PLA operational capabilities. China continues a systematic effort to obtain from abroad through legal and illegal commercial transactions dual-use and military technologies. Many dual-use technologies, such as software, integrated circuits, computers, electronics, semiconductors, telecommunications, and information security systems, are vital for the PLA's transformation into an information-based, networkcentric force. Several high profile legal cases highlight China's efforts to obtain sensitive U.S. technologies (e.g., missile, imaging, semiconductor, and submarine) illegally by targeting well-placed scientists and businessmen. U.S. Immigration and Customs Enforcement (ICE) officials have rated China's aggressive and wide-ranging espionage as the leading threat to U.S. technology. Since 2000, ICE has initiated more than 400 investigations involving the illicit export of U.S. arms and technologies to China.